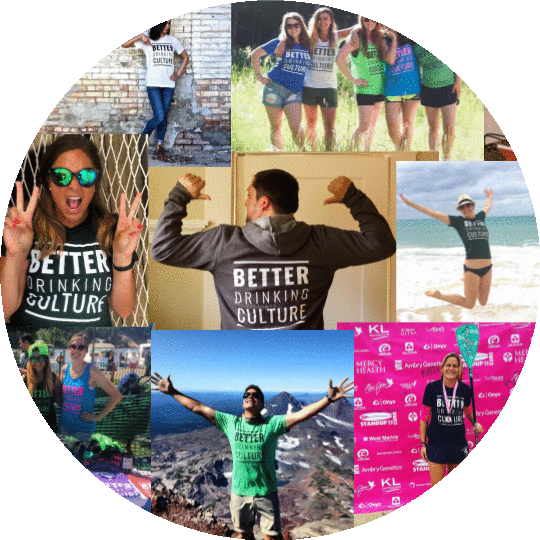 Better Drinking Culture (you can call us BDC) is a grassroots movement founded by a group of friends sharing stories about their experiences with alcohol. They uncovered that nearly every negative experience associated with alcohol was the result of drinking too much. Empowered to do something about it, we drafted a manifesto, printed some T-shirts, and started a movement to build a better drinking culture to set the example for the next generation. We are not anti-alcohol or a campaign. We are not created by the industry, university, or big business. We are by the people, for the people. We care about educating ourselves about the craft of what we drink, and sharing stories about why drinking better can make our lives healthier. We invite you to help us build a better drinking culture. Everyone's welcome at our table. We deliver a unique blend of health and craft education that helps improve our drinking experiences toward a holistically healthier lifestyle. We work with student leaders at colleges and universities to help promote this better lifestyle on campuses, and we recognize breweries, distilleries, wineries, bars, and restaurants with our industry Certification Program for their efforts in supporting a better drinking culture. We help share stories of the awesome people living a BDC lifestyle, empowering them to feel proud of drinking better and influence others to do the same. We promote these stories and messages through our blog, social channels, and repping BDC merchandise. We provide unique opportunities, events, and enhanced experiences for our members like the BDC Universal Mug Club by collaborating with sponsors, our Certified Partners, supporting establishments, and other industry advocates. Here's how you can support the BDC!